It might look like an enormously generous fairground prize. But no goldfish bowl in the world could contain this catch. 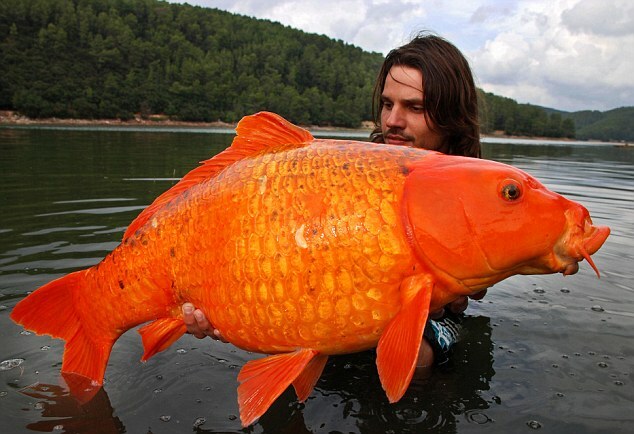 The orange koi carp weighs 30lb - the same as an average three-year-old girl - and is thought to be one of the largest of its kind ever captured. It took Raphael Biagini ten minutes to reel the creature out of a lake in the south of France - moments after fellow anglers told him they had spent six years trying to snare the legendary 'giant goldfish'. Mr Biagini, pictured, said: 'To begin with, we couldn't tell what was at the end of the line, but we knew it was big. After an impromptu photoshoot, the 30-year-old from Montpellier returned his prize catch to the water.